On Saturday, August 11, 2018 at 2:16 pm God called his son home. John Davis, Jr. was born on August 24, 1959 to the late John and Rosa Mae Davis and William “Bill” Carwell, Sr. His grandmother’s, Vernell “Bill” Mobley and Ruthie Mae Davis played a part in rearing John. 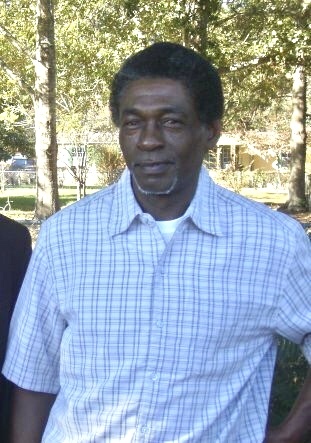 He was reared in Glennville Georgia and attended Tattnall County Public Schools. John “Stokey” was a well spoken man whom was loved by many. He was known for giving everyone close to him nicknames. He enjoyed fishing, spending time with family and his co-workers. John was employed several years with the Dasher Family before working with Armstrong Cricket Farm, where he was a devoted employee for more than 28 loyal years. He leaves to cherish his wife of 14 years, Lisa Davis of Glennville, Ga. 4 beautiful children, Lori Davis, of Reidsville, Ga., John Davis III, of Statesboro, Ga., Rochelle Davis, of Hinesville, Ga. and Jonathan Tippins, of Glennville, Ga; 2 step-sons Jermel and Demetrius Tippins, both of Glennville, Ga; 5 grandchildren, Saniyah, John VI, Destiny, Ron Jr. and Journee; 10 sisters, Sibley Davis, of Hinesville, Ga., Karen (Paul) Walthour, of Midway, Ga., Sharon (Calvin) Collier, of Glennville, Ga., Carla Davis and Carol Fountain, both of Glennville, Ga., Cornelia (Chris) Winters., of Montgomery, Al,. Veta Carwell of Collins, Ga., Roxane Carwell, Vanessa Carwell, and Lugreta (Sammie) Carwell all of Metter, Ga; 1 preceded him in death, Pam King; 3 brothers, William Carwell, Jr., of Reidsville, Ga., Hermon Lee (Linda) Carwell, Jr., of Metter, Ga, and Bernard Mincey of Atlanta, Ga; 9 aunts, Helen Harvey, Laverne (Clinton) Daughtry, Geraldine (Edward) Davis, Linda Williams, Gloria (Samuel) Hill, Gwitha (Willie) Warren, Bonnie Berry, and Shirley (Ernest) Harvell, Linda Davis; 5 uncles, Jerry (Diane) Mobley, Perry (Liz) Davis, Jerome (Misty) Davis, Robert Collins, Woodrow Brantley, Quinton (Dionne) Colwell; 2 sister-n-laws, Barbara Lisbon and Shirlene Perry; 2 brother-n-Laws, Joel Tippins and Billy Tippins and a host of nieces, nephews, cousins, and friends. The family will receive friends from 6:00pm to 8:00pm on Friday, August 17, 2018 at the funeral home. Funeral services will be conducted 1:00pm on Saturday, August 18, 2018 at the Chapel of the Glennville Funeral Home with the Reverend Jerome Davis officiating. Interment will follow in the Robert's Chapel Cemetery. Glennville Funeral Home is serving the Davis family.